Discussion in 'Modified Explorations!!' started by Buckshot, December 17, 2004. So, I decided that I wanted to keep the interior of my X looking similar to factory but have added enough extras that I needed a switch panel. and will also provide a location to hard wire my cellular phone charger/cradle and CB which will also both receive constant power available. I didn't want the panel to look like an afterthought, and I didn't want to drill 1/2" switch holes into any existing dash panels (in case I screwed up, that gets expensive). 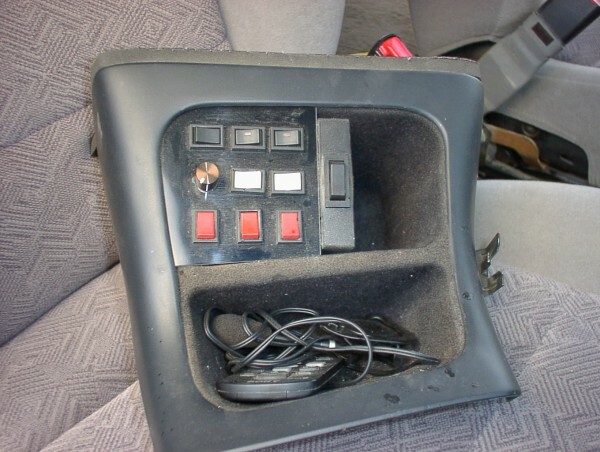 After talking to a guy who creates custom stereo installs, I decided to use a plexiglass panel mounted to my center console in one of the "catch-everything-and-never-cleaned-out-holes" below the climate controls. Once the BACK of the plexiglass is painted black, the front looks glossy with similar depth to it as the factory radio displays. Sounds awesome, I definitely want to see some pics. As you can see, I had several tries at this, with the final product at the bottome left. 1. Rough out - Not only do you have to cut the plexiglass very slowly to avoid splintering, it is prone to snap with any pressure on the drill while doing pilot holes, or the final 13/16th's hole saw. Go SLOW and let the bit do the work. Do NOT try to push through the plexiglass. 2. Adjusting to fit - Once the panel is rough shaped, you will need to use a sander and make several adjustments to get the curves to line up properly. When trying to check the fit, go SLOW with little force. The panel will need to be bent a little (the opening of this mounting location is not flat) but be gentle, too mush pressure and the plexi will snap at the weak spots until the switches are mounted in it. Notice how many I actually made on before getting it right? 4. Finishing - Cover the front of the plexi with scotch tape, flip it over and spray paint it. Do a couple of coats otherwise the spray pattern will be visible. 5. Mounting - drill a hole about 1/8" below the surface mount on either side. 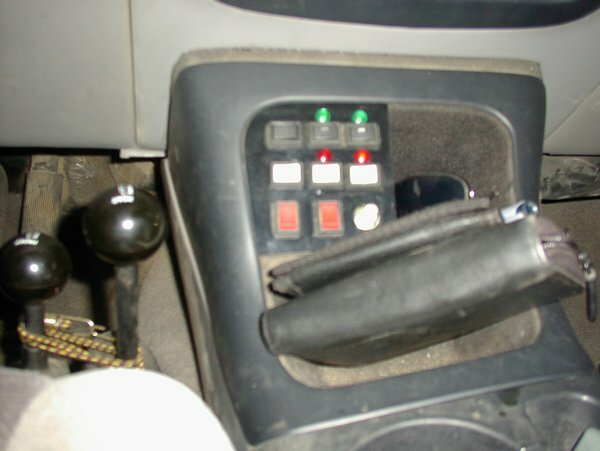 (Find the right spot by driving a pin in through the custom mount block on either side. You may want to do this before painting so you can still see through the plexiglass to see what you are doing behind it.) Screw blocks into the sides, then CAREFULLY screw the panel to the blocks. 6. Once mounted, there seems to be no danger of snapping as the slight outward bowing provides enough pressure to solidify the panel for normal switch use. In hindsight, this may best have been done on the filler plate underneath a replacement radio install, and if I change out the head unit to an aftermarket one, I may make a whole new panel. The good news is that with this modification, I can remove it and except for the two 7/64ths holes on the inside of the shelf and the one 1/2" in the top (not visible) for the wires, no one would ever know. I may also re-do the panel yet again, to completely cover the existing hole and make it look even better than the current half-panel look. P.S. Once the wiring is complete, the existing PIAA switch currently taped above the new switch panel will be removed. Yeah but his Explorer is cleaner. That switch panel looks sweet. And Jefe's got a place for his purse! But his comes with cammo and bullets. 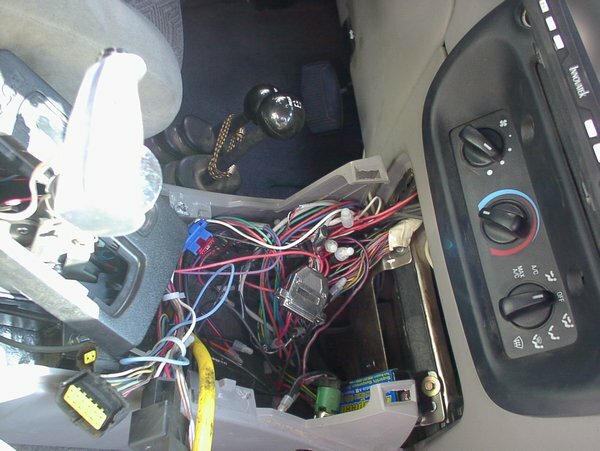 I thought someone posted a picture showing the brown wire to connect to behind the radio in the dash. ..but more importantly - what the heck do you need 9 switches for? I swear its just the picture. It looks cleaner in real life. Friction . . .its just sandwiched inbetween the 'fuzzy' pocket and the trim pieces. Its a 90* metal bracket covered in Engravo-ply with the 90* portion dividing the pocket and conceiling the wiring. Lets see, nine switches. I made the panel long ago and most of it was future at the time, but many are now in use, some have even changed use over time. I was going to engrave the panel with all the stuff, but i don't want to have to make another when i change switch functions again. Plus with the added LEDs there isn't much room. Besides, only I need to know what all of them do. All the wires run out a 1/2" hole in the back and are wired to a DB25 so that its all easily removable and reconfigurable. Looks real good! Where'd you get those switches?